The Type 4 Chi-To is a Rank III Japanese medium tank with a battle rating of 4.3 (AB/RB/SB). It was introduced along with the initial Japanese Ground Forces tree in Update 1.65 "Way of the Samurai". The Type 4 Chi-To looks similar to the Type 3 Chi-Nu, though with a longer chassis with an extra wheel. Turret is also similar in look, though the turret side is more smooth and has a machine gun sticking out the right side. The big differences on the turret is the gun barrel. The gun barrel has no muzzle brake in its design and the recoil tube has been moved from a single tube on the bottom to two tubes on top. Playing the Type 4 Chi-To can give the player a new impression of the Japanese tree line and a lasting one considering many of the Japanese tanks after it follow the same pattern. A tank with a very powerful cannon, decent mobility, but rather terrible armour. The terrible armour plus the tank's rather long reload means that the Chi-To is meant more for a long-distance shoot out than a close encounter. 10 mm RHA plates are scattered on the lower side hull. Turret ring is 20 mm thick. 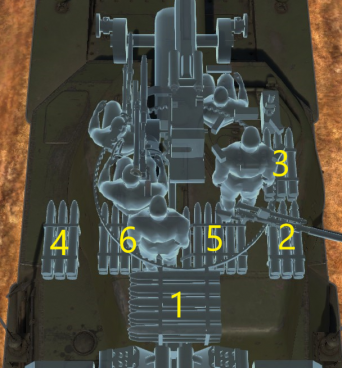 Ammo racks on the Chi-To. Against the medium tanks, its simply getting the first shot off first as the 75 mm Type 5 cannon on the Chi-To could penetrate most through the front hull armour, with some levels of difficulty on the turret. Of course, for maximizing the Chi-To's own survival, attack from the sides and make sure the enemy is unaware of the Chi-To's presence. Against the heavies is a more complicated method due to their armour becoming near impervious to the Chi-To if angled. Thus, it is best to go for the side armour if possible to deal the most damage possible. Though, the only tank most invincible to the Chi-To's armament from the front is the British Churchill Mk VII and maybe the American M4A3E2 Jumbo, so beware if caught in a frontal engagement. Powerful 75 mm cannon rivaling the T-34-85's, good penetration and very low shell drop-off. APHE round can easily defeat enemy tanks. A very powerful tank at 4.3, can tackle all foes at its BR bracket. Ammo in the turret can be emptied by carrying 15 less ammo. Very powerful Type 4 Kou shell with more penetration and more explosive filler. Decent top armour, enough to resist strafing aircraft weapons. Armour is average and mostly flat and unangled, like the Panzer IV. The Chi-To is asymmetric and is a large tank, it is difficult to hide from enemies. Angling front armour can expose the 50 mm hull cheek armour. Very hard to turn on the spot, especially when stock. The lackluster performance of Japanese tanks in World War II called for the development of newer medium tanks in the Imperial Japanese Army. The standard tank of the time was the Type 97 Chi-Ha, which has its chassis used in many expedient models to provide a bigger gun for the Japanese inventory such as the Chi-Ha Kai, Type 1 Chi-He, Type 2 Ho-I, and Type 3 Chi-Nu. By the time of Chi-Nu, however, the Chi-Ha chassis was becoming outdated and so a new tank design using an improved chassis was needed for future development. 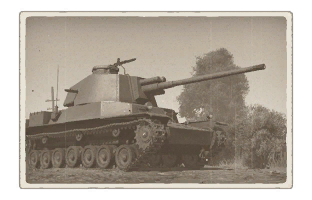 In 1943, development started of the Chi-To tank, which features a new chassis and more powerful engine. Its armament is a 75 mm gun based off the Type 88 anti-aircraft gun, giving it a high-velocity weapon. Armour on the tank was welded and was quite thick in comparison to its predecessor at 75 mm thick. The tank was accepted for service in 1944 and was expected to enter mass production with 20 per month at Mitsubishi and 5 per month at Kobe-Seiko. In terms of Japanese armour development, the Chi-To was the most sophisticated tank to enter production levels. 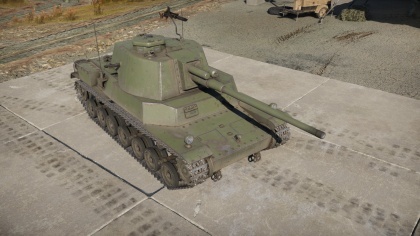 Despite its potential, the Type 4 Chi-To was never made in large numbers. At the war's end, only six chassis were made, with only two of those made into tanks. The tanks would be found by the U.S. occupation forces following Japan's surrender in World War II. The tanks were then transported to Aberdeen Proving Grounds for tests and would eventually scrap them in October 1952. This page was last edited on 16 March 2019, at 18:04.